Americans talk to me as if I am crazy for being a world traveler for 14 years. I know they watch the slanderous reports by CNN about other countries and think they are real, what am I supposed to do? "The USA people have guns." "I live in places where the only dangerous people with guns are the police." "They won't let normal people have guns." We could debate that for days, but the bottom line, is a small man, can become a big man with a gun in his hand. I was recently robbed in the Dominican Republic, probably the most dangerous country I have ever visited. And, they also have guns, there is something about power that enables violence to grow. What can I say... 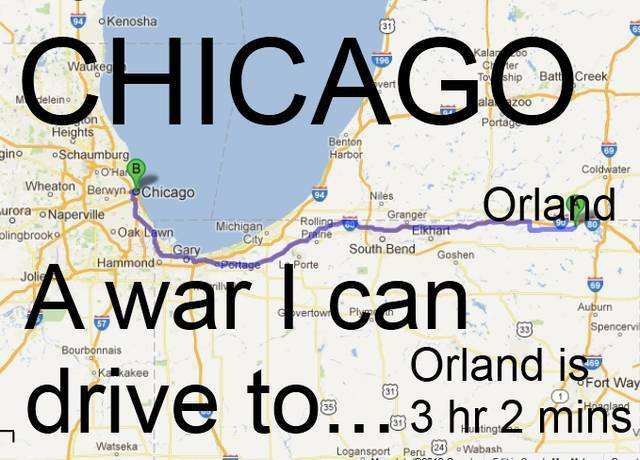 I am on a Road Trip around the USA, and I am going to circumvent the large cities. I know the bigger the city, the more the problems, the smaller the town, the safer is becomes. Africa is insanely safe: Why? Many culture in Africa have barely changed in 1000-2000 years, they are doing things the same as they have always done, and they just do not put up with trouble makers. However, when people go off to the city, to escape their father, their mother, their grandfather, their grandmother, they are free to become trouble makers. But in Africa, the only ones again who have guns is the police. Gee, just because one small country has a war, does not mean all 52 of the rest are dangerous. I think of driving on the freeway inside Chicago, I could accidentally get off the the ramp, get confused, and end up being in gangland. Let me think, have I ever heard of a drive-by shooting outside the USA? Not in my 14 years of living in 90 countries. Again, the only country I know where foreigners get killed by violence is in the Dominican Republic. I suppose some Mexican looking Americans get killed in Mexico. Don't you just love the political correct planet.... hehehe? Even a Hobo is afraid to say exactly what he is thinking. I made the mistake of turning on CNN, nothing good ever comes from watching that for me, it always makes me depressed, or angry. Normal TV in the USA is horrible depress, not the shows, the commercials. Funny how Mexicans inside of Mexico are more civilized than the ones that immigrate. There is something strange about people who go live abroad. I think we, or them, or me, or anyone who goes abroad to live has about a 90 percent chance of being angry, or wanting something for nothing. Immigration or emmigration is truly a horrible thing to a culture.